With so many exhibitions running in London all the time, it can be difficult to choose between them, especially when everyone is now asking you to pay the best part of £20 for the privilege. But good news for the culturally overwhelmed because there is only one exhibition you need to see this year – David Hockney’s retrospective at Tate Britain. It is 2017’s must-see show and one that will undoubtedly last you all year, allowing you to impress your friends with your knowledge of nearly 60 years of Hockney’s spectacular work. There are several things that have long made Hockney’s work particularly distinctive, his vibrant use of colour, the way he captures light whether it be the cloudier tones of Yorkshire or the startling clarity of the LA sun, and the deeply personal representation of everything that appears in his work. 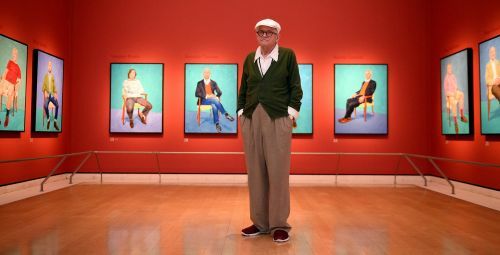 Of course all artists show us their view of the world, but Hockney at nearly 80, has spent a lifetime painting, drawing and photographing his friends, family and partners, as well as the places he lives or spent time. As you wander through the rooms at Tate Britain – much like the David Bailey show at the Portrait Gallery 2 years ago – it becomes clear that you’re seeing Hockney’s story unfold. This is art as biography. Most of the exhibition is in chronological order, which is a sensible approach from curators and means you can observe the clear evolution of his style and technique from his days as a student at the Royal College of Art to his most recent work made with iphone and ipads. And while the early work looks quite different, everything here is distinctively Hockney and this approach means that the consistency of his style can be observed. The early work is quite abstract and may surprise those who have only seen his later creations, but this laid the foundations for the way he would represent reality and the interaction of objects and people. And of course these early works feel like a young man trying to understand himself, particularly in a place where homosexuality was still a criminal offence, and the repeated inclusion of sentences in the pictures feels like you’re in Hockney’s head. His painting We Two Boys Cling Together from 1961 has the simplicity of a child’s drawing but it evokes quite mixed emotions in the viewer; there’s love clearly, anger too in the frantic brush strokes, but also this sense of incongruity as the heads float away from the bodies suggesting thought and reality are not yet in tune. Turning the corner into the second room and Hockney’s focus on people, which will run through his entire career, shows how that illusion became concrete with depictions of couples in everyday harmony including Domestic Scene  in which one man helps his partner to shower. This may not be the famous work you’ve come to see but its inclusion tells us important things about Hockney’s development as an artist, as well as his personal experiences, so don’t hurry past it too quickly. When Hockney arrived in LA in 1964 something in his work shifted, and a fascination with linear form, colour and light would dominate his work for years to come. In Room 4 you finally get to see that transition in some of his most famous pieces, including A Bigger Splash from 1967 which contrasts the roller-painted water and endless turquoise sky with the time-consuming construction of the white splash of water created supposedly by a figure we cannot see from a diving board that also isn’t moving. It’s an incredible piece that seems to create stillness and movement effortlessly, but the secret is the way Hockney uses different lines of varying lengths to give his work dynamism, and something that you will notice for the rest of the exhibition. 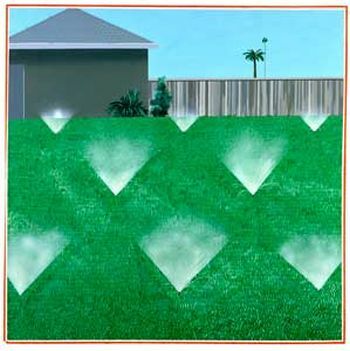 Next to it, is A Lawn Being Sprinkled comprised of hundreds of individually created blades of grass, where Hockney uses length to show depth and distance in the picture. It’s impossible to see on digital recreations or even that well on postcards, but its effect is remarkable, especially against the white sprinkler sprays dotted evenly across the lawn and the flat smoothness of the house and sky. The diagonal white lines of the window denoting reflected light in Peter Getting Out of the Pool  also sit purposefully alongside the crosshatching of the garden chair, the geometric perfection of the window itself and the pool tiles, while being challenged by the swirling pink and white tangles of the pool. There is a real sense of ease and warmth in these works which accounts for their continued popularity especially on a cold dank February day in very troubled times. 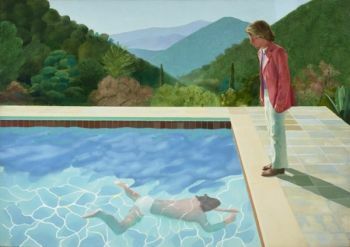 But Hockney’s fascination with the relationship between people, displayed so well in Portrait of an Artist (Pool with Two Figures) from 1972 as his ex-boyfriend appears to jealously observe Hockney’s assistant, leads neatly into his late 1960s and 1970s works on couples. The famous Celia Birtwell and Ossie Clark picture that you can normally see in the Tate for free is here, as is a fascinating image of Hockney’s own parents from 1977 that shows a separate togetherness. In almost every image in this room, one person is clearly the master in the relationship, and while Hockney’s mother looks sweetly at the viewer, his father is hunched over and engrossed in a book as if he has better things to do than pose for paintings. We see the same power dynamic in American Collectors  depicting Marcia Weisman in shocking pink as her thin, brown-suited husband stands limply by, mirrored in Henry Geldzahler and Christopher Scott  as the Met Museum curator dominates the canvas on a plush pink sofa, while his painter boyfriend looks on as if unsure whether he’s coming or going. One of the most fascinating elements of this exhibition is the chance to see work you don’t normally associate with Hockney’s exuberant coloured paintings. The delicacy of his drawings is almost astonishing after the scale and hit of the work before and Hockney’s light touch in images of Auden or his own self-portrait is really surprising. As I mentioned above it is Hockney’s use of the line that makes these images so interesting, using only a few skilled representative dashes to create personality and in some places it puts you in mind of the later work of Quentin Blake and Raymond Briggs. Hockney also experimented with collage photography and a room filled with layered photographs which he uses to instil liveliness in the static image, leads neatly into my favourite part of the exhibition, the images of the Grand Canyon and Yorkshire which were exhibited at the Royal Academy in 2012 and took ideas of scale to a new level. The winding mountains and roads you see in his early student work take form here as pathways and valleys sweep through abundant countryside, often in startling luminous colours. Seeing two contrasting landscapes side by side, the red and orange desert of southern America with the lush greens and bursting pale yellow flowers of Yorkshire, is an almost overwhelming immersive experience. Composed of nine individually painted canvases, Grand Canyon is a collision of purples, reds and oranges that suggest the heat and aridity of Arizona, while a related image takes the colour saturation to almost fluorescent levels which again digital or paper copies just cannot replicate, you have to see it. The Yorkshire work from 2006 onwards, when Hockney came home, is for me some of the best of his career and a culmination of everything this exhibition has shown you. Best of all is the two panel Hawthorn Blossom Near Rudston  which shows a red painted road with lines of blue depth that intersects the picture, framed by luscious grass verges and hedges filled with wild flowers and bursting yellow blossom moving in the breeze. The individual lines of grass and dots of flowers and leaves are romantic and calming in equal measure. 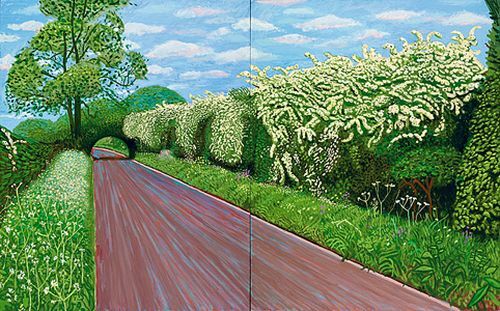 Nearby, May Blossom on the Roman Road  shows Hockney continuing to play with technique as a van Gogh inspired blue swirling sky meets abstract-formed hedges and abundant foliage. The scale and effect of this work is just glorious. Some stunning pencil sketches of Yorkshire follow plotting particular spots through the seasons as well as the immersive video of The Four Seasons which mimics the layering of photograph from earlier with a sensitivity to the opportunities of modern technology. Finishing the show are the ipad and iphone creations that Hockney has more recently embraced and despite being an entirely different way of creating art still have his distinct style and voice. The Tate’s exhibition was always going to be a hit, but even on this opening weekend, it’s clear that it’s been carefully planned to enhance the viewer experience rather than just packing people in. Despite the panic and two days with no online booking, tickets are still readily available and entry, even for those with timed tickets, is controlled in waves to ensure there’s no overcrowding. And it works because you can get close to every piece with very little jostling, and while most people are rushing through to the major works, taking your time means not only do you get the full story but by room 7 of 12 you have plenty of space. The chronological approach allows you to see Hockney’s life story develop, while observing his experiments with technology and the development of his technique. Not just light, colour and personality but his skilled use of lines throughout his career. So take you time – you can easily spend 90 minutes or more in here – and enjoy it all because this is a spectacular experience that people will be talking about for a long time to come. David Hockney is at Tate Britain until 29th May, before transferring to Paris and then New York later this year. Entrance is £19.50 or £17.70 without donation and concessions are available. Beatrix Potter stories, a trio of stuffed foxes frolicking in a faux wood, London Zoo and vial of mouse DNA all have one thing in common, they are projections of the way we see, interact and categorise animals. The Wellcome Collections latest exhibition considers how humans have imposed constructed categorisation on the natural world and, more recently, storified the role of other creatures in our lives. 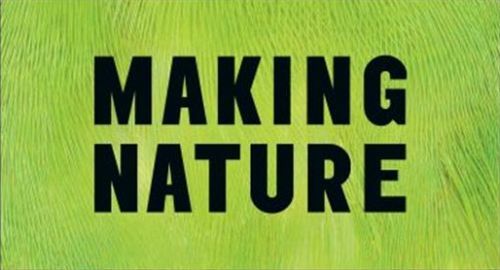 Making Nature: How We See Animals is the first part of a year-long programme on how humans interact with nature. And on the basis of this exhibition the Wellcome is opening up some fascinating debates. Being top of the food chain and having the ability to consciously reason and control our behaviour is something humans have long seen as separating themselves from and assuring their superiority over other creatures. And despite growing research on the more varied communicative responses and learned behaviours in the animal kingdom, we have long categorised, defined and controlled the world around us. All of this began in earnest, this exhibition argues, in the eighteenth-century when scientists began to classify and rank creatures as international exploration considerably expanded our knowledge of the natural world. The first section, then, looks at ‘Ordering’, centred around Carl Linneaus’s Systema Naturea published in 1735 which gave the two part Latin descriptions to all creatures that is still in use, and it is his idea of self-realisation that is the focus for this room. As ever with the Wellcome, the exhibition cleverly unites scientific and medical artefacts with art and culture pieces relevant to the period. Pictures borrowed from the V&A include a coloured photograph of the flower Linnaea Borealis from 1864 named after the scientist, and a poster for a ‘bearded-lady’ described as ‘half-human, half-animal’ who became famous for straddling the boundaries of classification. In terms of scientific pieces, the Wellcome has Linneaus’s 1758 pressed fish specimen which he used in his species description that has been remarkably well preserved for its 250 years. Interestingly, the Wellcome explains that original pieces like this became known as the ‘type’ specimen against which future discoveries are compared and differentiated, so it’s quite interesting to see such a defining piece. And to add further to the idea of classification, Linneaus’s system is put into the context of other forms of ordering the animal kingdom including Charles Bonnet’s 1783 hierarchy that considered the idea of creatures moving up the system as they evolve and become more intelligent. One curious aspect is how simply these apparently scientific systems sit alongside religious imagery and ideas, so while in the nineteenth-century evolution largely pushed aside the notion of one overall creator, somehow 100 years before the two sat easily side-by-side. So while Linneaus believed in natural theology, in Bonnet’s system, he sees humans progressing into angels, while Gérard Jean Baptiste Scotin II’s etching from Genesis shows Adam naming the animals in the Garden of Eden. All of this is nicely mixed in with ideas of assumed ‘fake’ creatures like the duckbilled platypus which leads neatly into the second room on how ‘Displaying’ animals adds to the kinds of fiction we have created around the idea of their homes and habitats. This will certainly be an important room for taxidermy fans and as the idea of the diorama took off in the nineteenth-century museums of natural history sought to offer more ‘realistic’ presentations of their specimens in the wild. As well as a curled-up badger on the floor which you should try not to step on, there is a family of playful foxes in a woodland scene in one of the cases, again mixing the notion of scientific depiction with the artistic and cultural transmission of knowledge to the public which the Wellcome does so well. But while such displays acted as a substitute for seeing the real thing, the exhibition argues that these images have created ‘stereotypes’ based on the ‘qualities and behaviours’ imposed on these animals by their creation which have affected and partially fictionalised our idea of these creatures. From plans for the original Natural History Museum layout prepared by its first director Richard Owen to its cathedral-like architecture captured by watercolourist Alfred Waterhouse, the Wellcome forces the viewer to think about how the presentation and display of animals has been “designed”. The NHM building itself plays up associations with an overall creator, while Owen specifically rated the creatures by importance and ‘complexity’ from the centre of the museum, and later the dioramas on display in this room attempted to “teach by the eye” whether visitors were looking at a giant dinosaur park at Crystal Palace in the 1860s or humorous presentations of squirrels playing cards. This bleeds seamlessly in to the next section on zoos and the fame accorded to individual creatures. In ‘Observing’ animals, zoos during the period the exhibition covers have veered between creating pseudo-natural habitats for their creatures to roam around in, and responding to the changing architectural interests of the day. London Zoo’s famous elephant house designed by Hugh Casson in 1964 was created to showcase the animals to the public rather than replicate their “normal” environment. And Casson’s now listed enclosure was in keeping with the brutalist designs of now equally famous culture centres like The National Theatre and the Barbican. As a extension of this, the exhibition shows how humans project stories onto the existence of particular creatures developing ‘celebrities’ in the animal kingdom and ascribing a meaning and agency to their lives that animals do not experience. There are music sheets for a London Zoo elephant called Jumbo who eventually joined the circus and toys and merchandise celebrating the 1950s chimps tea parties which are the antecedents of ZSL’s popular animal adoption programmes and late night visiting opportunities, encouraging visitors to engage with its inhabitants more closely. Part of this storification is usefully employed to aid conservation. There are images of bison taken by William Temple Hornaday in the late 1800s who hunted them in order to preserve these endangered creatures in the Smithsonian Institute – clearly not entirely understanding that by killing them, he was adding to their scarcity – while in the final room this idea of preservation has led to scientific experimentation with animal DNA to improve breeds or to solve human problems. More than anything, this last section forces you to think about the varied and unconstrained power we have over the animal kingdom. From selective dog breeding to overriding natural birdsong by teaching them human tunes, to genetic engineering, redesigning, repurposing and adapting other creatures for human requirements is a fascinating and scary business. Focusing on the collection of the Pittsburg Center for Postnatural History, dedicated to organisms deliberately altered by humans, there are vials containing a ribless mouse embryo, photosensitive E.coli and a frog that can tell if you’re pregnant, sitting alongside selectively bred examples of King Charles spaniels, budgies and pigeons. The Wellcome makes no judgement on whether you think this is right or not, but while we all know it happens, seeing it so starkly gives you a lot to think about on the way home. Arguable then, we don’t see animals clearly and in their own right, but as part of a socially constructed system of classification that for at least 300 years has influenced our mastery and dominance of nature. Seeing them as something less than us means we have cutesified their lives adding rationality and purpose they do not experience, and our continual dominance on the planet rests in modifying and adapting their genetic make-up to improve our own lifespan. The Wellcome’s new exhibition is a fascinating insight into our relationship with nature, beginning what promises to be an important year of complex debates. For many the 1960s was the epitome of freedom, style and youth culture, an explosion of colour, music and fashion that inarguably shaped the subsequent decades, an influence that is still felt today. Or so goes the argument of the V&A’s latest major exhibition that looks at the ‘significance and impact’ of the late 60s. For those of us who weren’t there, the V&A makes a strong case and throws in a few surprises by considering not just the obvious pop culture aspects, but also the emergence of political protest in multiple countries, key technological innovations and a growing concern with an eco-friendly lifestyle. But it all begins with the more obvious, but still highly entertaining, story of swinging London, political scandals and the integration of music and fashion. We may have heard it all before but the V&A takes a more academic approach to presentation with detailed descriptions of every object as well as an admirable collection of exhibits that add considerably to the argument the exhibition is making. It’s clear the museum has learnt so much in recent years from its blockbuster shows and the importance of visual design is now as valuable as the objects on display. Technology too is integrated into this show with video screens and presentations throughout, but most importantly a headset (for once included in the price) that wirelessly connects to films and recordings as you walk by allowing you to listen without having to control the audio guide yourself, and plays a variety of 60s tunes to you – from John Peel’s record collection – the rest of the time, immersing you entirely in the years under discussion. Utilising the citrus colours of psychedelia, the first section looks at youth culture, art, fashion and music with examples from clothing store Biba, a video of stylist Vidal Sassoon cutting a V-shape into the back of a woman’s hair and posters referencing art nouveau from the First World War. Everything changed is the message here; from hemlines to morals, the late 1960s was a blast of fresh air on a fetid backward-looking society. A lot of that is debatable and arguably it is the older generation who did much to alter the laws that decriminalised homosexuality and abortion, but seeing this collection all at once certainly replicates the vibrant feel of the times. From Twiggy’s clothing line on a mannequin that is frighteningly designed to look like her, to Mick Jagger’s all-in-one white stage outfit, Sandi Shore’s dresses designed by husband Jeff Banks (and let’s not forget he went on to design clothing for Sainsburys), the chair Christine Keeler provocatively posed on during the Profumo scandal to the newly launched magazines of the era, this section is all about fresh faces and creative endeavours. Interesting too is the focus on fame and how the perceived lifestyles of particular celebrities helped to shape the commercial and cultural effect of the era leading to clothing catalogues replicating celebrity outfits and the craze for shopping that resulted. The new photographers like David Bailey and Ronald Traeger took pictures of people like Michael Caine, Terence Stamp and even the Krays that are on display here which define this confluence of art and style. Unsurprisingly, at many points this feels as much an exhibition of The Beatles as it does an examination of their era, with almost every section containing costumes, clothes or handwritten lyrics jotted down on scraps of paper. In section two on the effect of LSD, which was legal until 1966, their stage outfits from Sergeant Pepper and a sitar. There’s a lot of material in this section that looks at the growth of “counter-culture” clubs and their impact on design, which is interesting but a little too text heavy, and you’ll find as with the rest of the exhibition, it is The Beatles sections everyone is crowded around. Most unexpectedly the V&A has included a large section on the political disputes, activism and riots of this period, many in response to the Vietnam War, and developing attitudes to race, sexuality and gender politics. After the brash whirl of the early sections this is a tonic, clearly showing that beneath the façade of cool celebrities and consumption, dark and complex changes were occurring in societies across the world that laid the foundation for many of the freedoms we take for granted today. There was a shift to using posters for political purposes and many are on display, along with protective clothing worn by The Black Panthers and French Police, as well as brutal photojournalism showing dead students in America as a result of an out of control protest – a stark and fascinating contrast with the slick image of celebrities in the previous room. Clearly, the late 60s saw a flowering of popular culture but also of youth engagement with pertinent political and social injustices. Being the V&A a section on design is almost mandatory and while this section on consumerism and technological development has some interesting objects, it almost warrants a whole exhibition on its own. It’s a very broad ranging room, taking in developments in advertising, paper dresses printed with a Warhol-influenced soup poster print, space suits from the moon-landing, Expos and a Kodak Carousel anachronistically accompanied by a relevant scene from Mad Men. It feels a bit too lightweight on its own and could have made more sense if tied into the later room on the growth of communication technologies and personal computing. It’s nice to include but is a little flimsy in linking such innovations to its overall argument about the ongoing influence of the 60s. One of the showcase sections is the semi-recreation of Woodstock, shown on enormous surrounding screens including performances from Hendrix and The Who while the floor is covered in fake grass strewn with beanbags for visitors to lie-back and enjoy. Around the room are several of the costumes worn by musicians as well as Keith Moon’s drum kit and Jimi Hendrix’s guitars in various states of destruction. For music fans this exhibition is a must and the amount of original material the V&A has gathered is incredible, and if you can fight the reminiscing baby boomers for a beanbag this room is well worth a longer stay. But it links neatly into the section on the creation of ecological communities, who rejected technology and traditional city life for country communes. It’s certainly clear that festival-going has moved from its alternative roots into a mainstream preoccupation for many in the summer, with environmental concerns are hotly debated, while our modern preoccupation with being permanently “online” is developing its own backlash – a return to counterculture modes perhaps? The exhibition ends with 1970 and the ushering in of a slightly different era typified by calls for peace, love and social cohesion. It ends with Lennon’s Imagine – a song many will have an ambiguous relationship with now – as well as a jacket he wore at the time. Its tone is a bit of a whimper after such a furious beginning and high-stakes political discussion, but perhaps that’s how all decades end, a quiet slide into the next one taking only some of their style and substance with them. Yet the V&A makes a compelling case for the influence of the period 1966-70 on the modern world, and while a lot of the changes it trumpets were grounded in the post-war upheavals of the 1920s-1950s, the 60s has a hold on our imagination that is hard to shake. This is a full-on and at times overwhelming show, full to the brim with interesting exhibits – to wallow in it, head to the V&A and enjoy this anthem to the decade of style. There are many things a trendy Londoner can do on a Saturday night; there are exciting restaurants to try, hot West End shows to enjoy and any number of music venues, pubs, clubs and summer festivals to partake of. However, if you’re looking for something a little different then then the Royal Academy could be your new place to be. At 7pm on the biggest night out of the week while the rest of London is jostling for elbow room to eat their expensive dinner, or squeezing their wallets to afford a decent view of whichever A-List actor is treading the boards this month, you could be leisurely strolling round the new David Hockney exhibition for a mere £10 and a good 3 hours grace to take it all in. Museum lates have become a big thing in the past couple of years with some even offering the chance to sleep there over night, and while most will open later one night per week, usually a Thursday or Friday till 8pm or 9pm, the Royal Academy (and Tate Modern) stays open till 10pm on a Friday and Saturday night, meaning while everyone you know is heading for the same tired old venues or yet another season of X-Factor, you can be starting a new trend for Saturday night gallery visits. I should note at this point, it’s only for the summer to allow more people to see its main Summer Exhibition, but who knows how influential it may be. So over to Hockney then, and the Royal Academy has an excellent track record of exhibiting the artist’s work, particularly the stunning Bigger Picture show in 2012, comprising landscapes largely inspired by his native Yorkshire with some created using an ipad. The show was hailed for its radiance as it charted the changing seasons and it became one of the most influential exhibitions of the year. This new show isn’t quite in the same league, but it does give fascinating insights into Hockney’s use of colour, light and his social circle. So having devoted a show to British landscapes, Hockney has returned to his beloved LA for this one, creating 82 individual portraits of his acquaintances, friends and neighbours in California. Each one is situated in exactly the same spot in his studio, against a blank wall, and uses exactly the same chair. Each sitter has been allowed to choose the position of the seat, their pose and their clothes so while there are subtle differences between them reflecting the individuality of the models, they also have a strange uniformity that is all about Hockney himself. The quality of the portraits is debatable, they’re certainly rough given the limited timescale imposed on each one and in several places pencil lines are still visible under the paint. They’re almost impressionistic at times as sweeps of colour imply form, while perspective sometimes goes awry. There’s plenty of wonky feet and oddly shaped hands, yet sitters agree that Hockney has captured them; Edith Devaney wrote that she ‘found my likeness somehow both familiar and unfamiliar’ while Hockney replied that “I have got an aspect of you”. But looking at them altogether, it seemed that accurate depiction wasn’t really the point – or he would surely have devoted more time to them – instead it’s the process of creation, the compiling of a substantial body of work in three years and the opportunity to play with colour that seem to be the real purpose of this show, and in that sense it is very successful. Hockney’s palate naturally changes when in California so the deep browns and greens so prevalent in his Yorkshire landscapes, become vivid blues, greens and yellows in the American sunshine. Psychologically, people are more daring in the colour of their clothes in warmer weather so be prepared to see plenty of hot pink trousers, acid yellow shirts and orange jumpers, mixed with the more conservative navies, browns and whites that are most people’s staples. To what extent Hockney has exaggerated the original colours for effect is for us to interpret, but a reunion with all 82 sitters might be a sunglasses affair! But these colours make such an impact because Hockney pairs them with a perfect background shade of green or blue. In fact every single portrait is united by this slightly changing colour scheme – a plain wall and floor painted in a wonderful variation of shades of just green or blue that help the viewer to focus on the subject or a particular item of their clothing, such as Rita Pynoos scarlet silk skirt, artist Bing McGilvray’s startlingly yellow-green shirt or Martin Gayford’s orange jumper. But there are plenty of pictures where the subject is wearing much more muted colours, yet still these warm background tones give a kind of animation to the subject that is at odds with their expression and reticence. Hockney’s sister Margaret and her friend Pauline look like reluctant subjects and interestingly, no one looks thrilled in these pictures either, there’s a lot of grumpy faces and some occasionally aggressive postures, suggesting the lack of comfort felt by many of the sitters. Gregory Evans’s arms folded scowling gesture speaks volumes, while designer Celia Birtwhistle perches tentatively on her chair as though needing to run away any second. One of the triumphs here is the way in which Hockney has used a huge variety of peach and pink shades to give shadow and shape to the faces he depicts and up close you can see how carefully he’s observed the way light falls across the nose and cheeks to make these faces come alive. As you walk around this gallery you begin to pay less attention to the individuals and more to the way in which Hockney has captured their gestures and body language. Despite the odd famous name, perhaps most striking of all is the ordinariness of all of these people, for the most part painted with all the lumps and bumps of middle age. The use of colour particularly in the background takes that ordinariness and illuminates it, because as Hockney said these people are his celebrities. It’s not Hockney’s most brilliant exhibition and if you’re looking for perfectly produced portraits then that’s not really the point of this. Instead see it as a step on the road to understanding how Hockney sees the world and will certainly give useful context for the big retrospective announced at the Tate Modern in 2017 where hopefully the Yorkshire and California work will sit side by side. The decision to see this at 7pm on a Saturday was the right one as the busy gallery rapidly emptied of people off to other things. It meant plenty of space to see the work without a crowd and time to think about it properly – so thanks to the RA (and a small number of galleries) we can make Saturday night art a real option for Londoners. David Hockney: 82 Portraits and 1 Still Life is at the Royal Academy until 2 October. Entry is £10 and concessions are available. “Is there anything new to learn about the First World War, don’t we know everything already” I was once asked at an interview. One of the most positive aspects of the raft of Commemoration events that have emerged in the last two years – from exhibitions, plays, books, stories and other engagement activities – is this diversity of war experience that has, really for the first time, contextualised the terrible experience of soldiers with other contributors to the war. This has incorporated battle zones beyond the Western Front and life at home, as well as exhibitions on the Royal Flying Corps and the Royal Navy which were my own research focus. All of this has given the public a much wider sense of what the war meant and its far reaching effects on society. Adding to this welcome new crop of voices is a brilliant new exhibition at the Science Museum focusing on the medical profession during and shortly after World War One, and the development of treatments and facilities to help injured servicemen both at the Front and in the UK. The main section is divided into three colour-code blocks to aid navigation, focusing first on the physical journey of a wounded soldier from the front through the various treatment points and eventually back home to Britain if the injury was severe enough; second it looks at the scientific and technological advances in medicine that the war created and the ways in which innovation and the repurposing of old ideas took place, before finally considering the long-term work taking place at home in plastic surgery, prosthetics and support for mental breakdown. But the exhibition opens with a brief introduction to the period before injury and we’re shown examples of shells and shrapnel that were designed to cause maximum damage and destruction to the trench systems of the Western Front and the human flesh within it. The randomness of war is something that comes across strongly and a small display of “lucky charms” and amulets is a powerful example of how much reliance soldiers placed on concepts of chance and mystical protection in a highly uncertain and dangerous environment. Nearby is a bloodied stretcher which crucially sets the scene for this exhibition – it is the first artefact we encounter and would have been the wounded soldier’s first contact with medical assistance. Round the corner and the orange-painted display cases chart the process of moving injured men to various treatment stages depending on the severity of their wound – including the roles of Regimental Aid Posts and Casualty Clearing Stations – a structure that was overwhelmed by the 400,000 casualties received during the first 140 days of the Somme campaign the exhibition tells us, which led to numerous inventions to speed the transportation of wounded men. Items such as the Colt Stretcher, a hammock-like structure, made manoeuvring easier in narrow trench systems than its flat-wide predecessor, while further up the line motorised ambulances and wheeled transportation trolleys were increasingly common in the wake of the 1916 campaigns. One of the best exhibits is a scale model of a transport train kitted out with bunk-beds that can be flattened against the wall for moving masses of men at once. This section is a meaningful and well executed explanation of the process of developing treatment offered to men at the Front. The blue section has a slightly unclear starting point but offers a number of mini-stories of progress in the development of particular scientific advances. There’s another incredible model of a complex and tight trench system showing wounded men being evacuated while others are being treated on the spot in dugouts or resting on fire steps. You can move around this section in any order and looking at the development of equipment of blood transfusions, field dressings with iodine given to each man in his pack, splints for broken legs, gas masks and protectors, and oxygen masks used by multiple people at once. Each area focuses on the scientist or inventor who developed these vital instruments, giving them a necessary moment of recognition in the history of medical technology still in use today, as well as reminding us that the Allies were engaged in all kinds of vital war work, not all of it wearing a uniform on the battlefield. The final section will be the hardest for some to see, although a very necessary part of our understanding of the consequences of the First World War. It looks at rehabilitation and surgical innovation to help those permanently disabled or disfigured by the conflict, returning home to a society largely unprepared to see what war had done to its citizens. Most moving and fascinating are the work of Henry Tonks whose pastel sketches show mutilated faces transformed by plastic surgery. Tonks worked with surgeon Harold Gillies – whose story was dramatised in a so-so 2014 play called Dr Scroggy’s War at The Globe – in wards devoted to facial repairs in Cambridge and Sidcup. There are also examples of prosthetic limbs including legs and arms with replaceable hand sections depending on the sort of manual work the individual needed to do and whether they could afford a slightly more elaborate full hand. As with much innovation in the First World War a single change would have a knock-on effect for other developments and here we see examples of new cutlery and crockery developed for those with prosthesis. As an addendum to the main exhibition, there is a short display at the end focusing on modern conflict in Afghanistan which cleverly draws a direct comparison between some of the medical items and personal charms from the First World War with similar pieces still used in combat zones today. As with aeroplane technology almost everything it could do were conceived from 1914-1918, and what came next was largely refinement, much is true of the medical innovations on display here, really emphasising how crucial the war was in setting in motion things we take for granted today. Wounded: Conflict, Casualties and Care is a fascinating and welcome addition to programme of diverse and inclusive events honouring the Great War, and one that is not to be missed. Much work has gone into coordinating pieces from other museums including the Imperial War Museum (whose own rather lacklustre new galleries launched events in 2014), the Wellcome Collection and several medical museums. The timely launch of this exhibition, a century on from the Somme campaign, captures a new wave of interest in the war, demonstrated last week by Rufus Norris and Jeremy Deller’s moving We Were Here project placing volunteers dressed as First World War soldiers all over the country, each handing out a card with the name of a man who died, to mark the anniversary of the breath-taking brutality of the first day of the Somme, as well as the poignant all-night Vigil and services at Westminster Abbey which included two beautiful and evocative readings of original testimony by actor Luke Thompson (Reading 1 from 33 minutes in and Reading 2). So the answer to that original question is of course we don’t know everything about the First World War. And with the range of Commemoration activities that have grown up around this 100 year recognition touching on all kinds of experience of the Great War, it’s clear that there is still so much more to learn.